That special day where we recognize how important dads are in our lives is coming up soon. Our friends at Gourmet Gift Baskets shared this list of some of the top gifts for dads this year. You can also see the full selection here. My hubby has been the recipient of some of their gift items (he especially likes the ones that include craft beers!) and ordering a gift for dad couldn't be easier than ordering from GourmetGiftBaskets.com. When you find something that dad will love, be sure to use the code FDAY10 for 10 percent off of your Father's Day purchases. If the Dad in your life prefers a mini-golf bag (that doubles as a cooler) to a tin, then this is the ideal choice for him. 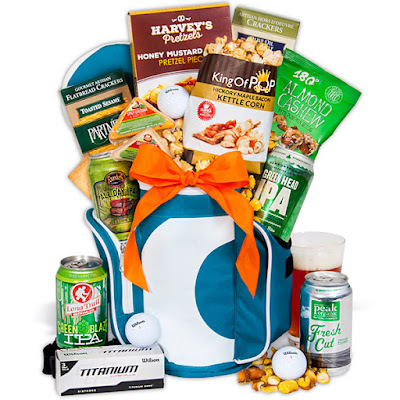 The 19th Hole is loaded with everything your favorite golfer needs for a day on the green, including four refreshing beers, a sleeve of golf balls, and a range of gourmet snacks like cheese and artisan crackers, hickory maple bacon popcorn, and zesty pretzel pieces. (If my kids are reading this now, this is what I want). Now, if the Dad on your list cares more about barbecues and less about golf, this gift has his name all over it. This reusable stainless steel bucket is stocked with everything Dad needs to create a gourmet barbecue meal. It includes three refreshing beers (first things first, right? ), along with three gourmet spice rubs, buffalo wing flavored gourmet popcorn, and more. (Another option for beer lovers is the very popular Spring Seasonal Beer Bucket). Look no further than your own backyard to find your Dad’s most cherished memories. It’s where he helped perfect your pitch, showed you how to play badminton, or helped set up your first volleyball spike. Pay homage to those times with this delicious popcorn sampler that perfectly unites Dad’s most prized memories with his favorite tastes. 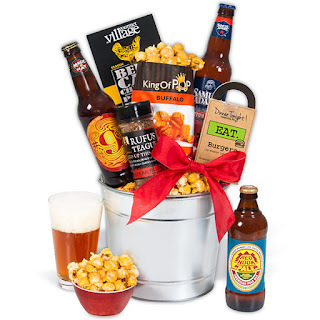 Comprised of GourmetGiftBaskets.com's Honey Mustard, Hickory Maple Bacon, BBQ Ribs, Chipotle BBQ, Cajun, Buttered Corn On The Cob, Dill Pickle, Zesty Ranch, Sun Dried Tomato, and Watermelon popcorn flavors, this sampler helps you flawlessly celebrate your father on his special day. Looking for an impressive gift that makes a big impression (on a budget)? This newly designed Father's Day Gift Tower fits the bill. A mouth-watering selection of sweet and salty treats can be found inside this impressive four-tiered tower. These include crisp handcrafted popcorn, sweet candies, gently roasted honey peanuts, and more. (By the way, gift towers are a big hit with Dads and their kids, as he usually needs to share the goodies with the entire family). Some Dads are in a very health-oriented phase of life. Those fathers would surely appreciate this woven basket filled with juicy pears, oranges, and crisp apples, along with an assortment of Vermont cheddar cheese, premium Virginia peanuts, and a salted caramel dip.